Harringtons Grain Free Wet Food for Dogs is a nutritionally complete diet that has been carefully formulated to provide wholesome grain free goodness. 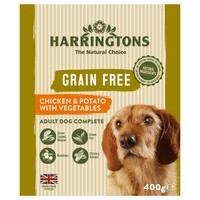 Made with 100% natural healthy ingredients including Chicken as an excellent source of protein, Harringtons Wet Food also contains all of the vitamins and minerals your dog needs for an active and healthy lifestyle. Contains no artificial colours or flavours, no dairy, no soya and no added wheat.